You are here: Home / Den Talk / Chaps, Jones, Expansion & thanks to Regina. Chaps, Jones, Expansion & thanks to Regina. The 2013 CFL season has come to an end, but off-season is set to begin with a bang and already some dominoes have started to fall. The clock has finally run out on Jacques Chapdelaine’s run with the BC Lions after the two sides mutually agreed to part ways. No one has taken more heat than the long-time Lions offensive coordinator, nor handled that heat with the class that Chapdelaine has shown. He has been the fan whipping boy for years, and has been accused of being too predictable with his offensive play calling. The running game this season was likely the nail in the coffin for Chapdelaine, who did get things turned around when Stefan Logan was added to the backfield late this season, but it was too late, and time for a change. As per Lowell Ullrich, two names that have been mentioned as possible replacements are Paul LaPolice who has a great relationship with Mike Benevides, and Saskatchewan Roughriders coordinator George Cortez who has strong ties to Wally Buono. LaPolice has reportedly spoken with the Alouettes about their coordinator vacancy, and may be in the running for a head coaching position with the new Redblacks franchise in Ottawa as well. Cortez would have to leave a pretty good situation in Saskatchewan, and is reportedly comfortable there. After taking some time to reflect on this past season, I’ve concluded that both I and the BC Lions need a change moving forward,” said Chapdelaine. “It has been a great privilege to work with Lions players, coaches and many other members of this outstanding organization. At the commissioner Mark Cohon’s media address in Regina, he was asked about the decision to not publicize the names of unprotected players prior to December 16th’s Ottawa expansion draft. Many felt that the league was missing out on an opportunity to promote itself and to create off-season buzz around the event. Cohon’s reply was simple. They considered the pros and cons to all scenarios, but decided in the end that the relationship between coaches and their players was the thing that trumped all and when you think about it, that makes sense. Coaches didn’t want to deal with disgruntled players who may have felt under appreciated if left unprotected. I have been telling a few people for a few weeks that I though Chris Jones would be the next coach of the Edmonton Eskimos and the hire that was first reported by long-time Esks beat writer Terry Jones during Grey Cup week was made official today by the team. Jones is a great hire in my opinion. Defence wins championships and there are few defensive coordinators that have been better and more innovative than Jones in recent years. The Eskimos have some nice pieces on defence and I expect them to take advantage of Jones’ expertise in that area to fix that part of their game. Jones has paid his dues and was a solid choice to replace Kavis Reed. Most regular Grey Cuppers were expecting to deal with the logistical challenges of attending the 101st Grey Cup in Regina and there were definitely some to contend with. But the passion and welcoming nature of CFL fans in the capital of Saskatchewan certainly made up for a lot of that. I can’t count how many people wearing green and white came up to me and thanked me for attending the event and I heard stories from friends of other teams of locals buying them drinks, offering rides and helping in any way they could. A special shout out to Norm and Jamie Peel who hosted us in their awesome new house in Regina, because without them we wouldn’t have been there. I was nice to see them experience the win in their own town, knowing what it was like for Lions fans in 2011. And if you’re ever in Regina looking for a place to have a drink, check out Leopold’s Tavern on Albert Street. It’s a great small bar that was our home base at Grey Cup 2013. 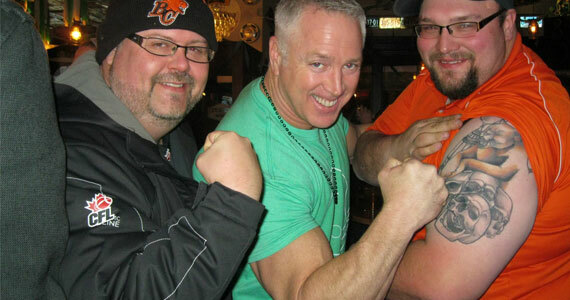 And with that we leave you with a photo of our first night in Regina at Leopold’s and the pose off between me, Matt Dunigan and my buddy Nick Herger. I kept the jacket on to not embarrass them.